The days of kitschy garden objects so popular in suburbia are over. Pink flamingos have left their perch and gnomes have wandered back to their fantasy lands. Gardens today are taking on a more upscale, personal feel, as people incorporate unique items that will set their spaces apart, creating backyard oases that are as welcoming as their own homes. 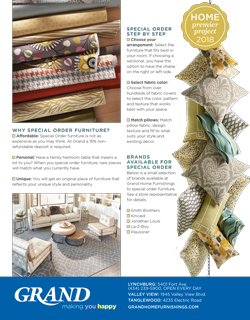 As you plan your spring planting, consider placing a few garden accessories that will complement your plants and make your space even more inviting. Even if it’s too early to plant, it is never too early to buy garden accessories – and garden stores are stocking up on these items even as you read this. 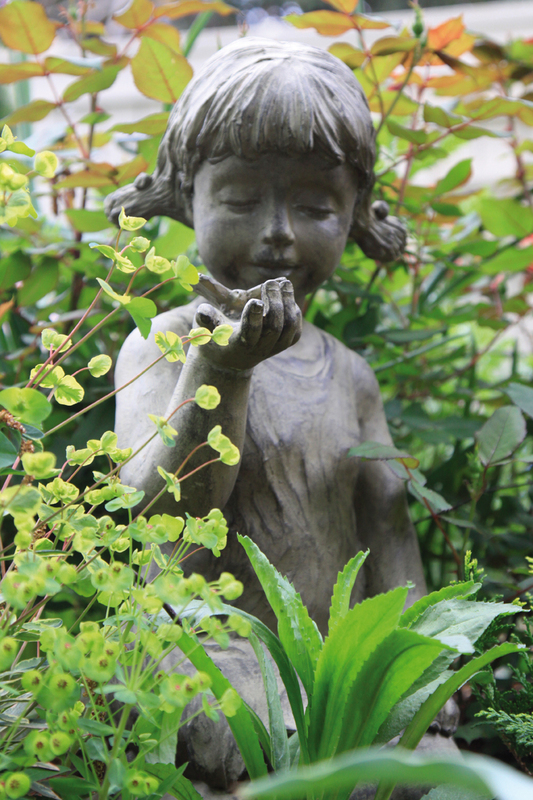 Pay them a visit and you will discover garden art in all themes – from Asian minimalist with simple lanterns and stones, to Americana folk art with wagon wheels and barrel planters, and even the eclectic and whimsical, with gazing balls that come in all colors of the rainbow. Deciding on a theme may be the hardest part. The idea is to create a cohesive design, so consider using objects of the same finish or material, like all wrought iron, or all wood, or even objects made of the same type of stone. Whatever material you choose, objects should be sprinkled throughout the garden, grabbing just enough attention to make them noticeable, but not enough to take the spotlight away from those hard-earned blooms. For instance, place colorful garden globes slightly behind shrubbery of about the same height. 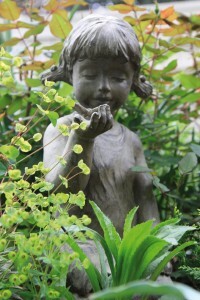 Likewise, place small statues beside ferns, ivy or other ground cover. The key is to be selective; the more objects you add, the more your garden will end up looking like a store display and less like a natural outdoor space. If you are a collector (and it’s easy to collect these items, especially if you love to travel), choose a few of your favorite items to set out each year, or switch some out in the middle of the season. Gardens are all about stimulating the senses. You may be focused on planting colorful plants, with wonderful fragrances, but what about choosing elements that will bring sweet sounds to your ears? The best sounds may come from wildlife that decide to settle in for the summer in your backyard. 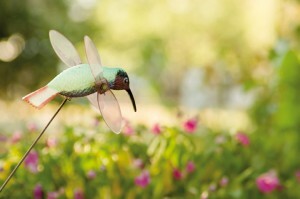 Consider this wildlife when placing your garden accents. A bench is always nice, but if it’s near your butterfly garden plants or a birdbath, move it several feet away so you won’t disturb your fluttering guests. Place birdhouses near a tree or shrub, because birds often like to perch somewhere first and scope out the environment before they choose their living quarters. It is better to place birdhouses in the shade. Place birdbaths and bird feeders in separate areas of the garden. With the variety of birdhouses available, you can pretty much guarantee your birds a custom home. Spending some time researching what birds live in your area and what plants are their favorites will allow you to pick their dream homes. If you choose an elaborate birdhouse (there really are ones that are miniature models of Hollywood mansions), you can choose a bird spa to go with it. Birdbaths these days can come lighted, heated, and even include water sprays, drippers, bubblers and fountains. In fact, birds are often more attracted to moving water, plus there is less chance for algae growth. There are solar-powered styles, which make it very convenient to move them around to different areas of the garden. Choose the size of your birdbath in proportion to your garden space. Another way to bring sound into your garden is to use wind chimes. There is no shortage of styles available, from simple metal pipe chimes, to the softer sound of bamboo, to the music lovers’ delight: precision-tuned chimes (listen to some samples at thebestofchimes.com). They even have a Westminster chime that plays the familiar tones of London’s Big Ben. 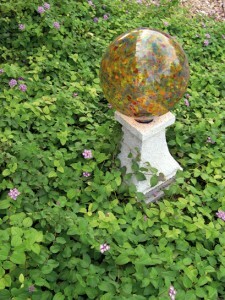 The company is known for its hand-crafted glass wind chimes that can add playful color to your garden. If your garden is near your house, consider a rain chain, or rain chime, to create a natural, soothing sound. Originating in Asian cultures, these “kusari doi” (Japanese for “chain gutter”) take the place of downspouts. Often made in copper (which creates a beautiful patina over time) but also made in stainless steel, they include a strand of chains with a series of whimsical funnels in all different shapes—cups, pineapples, flowers and umbrellas, for example. You can place a ceramic pot or stoneware at the base for a more decorative look. Many garden objects have been around for centuries. The rich history itself is why many people use them as accent pieces. Take sundials, for example. Dating back to ancient civilizations, people have used these objects to tell the local solar time (the location of the sun on the horizon). Sundials range from the simple horizontal types, made of stone with Roman numerals and a basic stone stand, to larger “armillary sphere” sundials with spinning rings (you may need an astronomer or a few hours of research online to learn how to use one of these, but they are a beautiful, classic garden ornament). Even the basic horizontal sundials come in so many designs today. The gnomon—the rod on the sundial that casts the shadow—can even come in the shape of a peacock or a butterfly. Fast forward a few centuries and you will find the obelisk, an Egyptian feature that has found its way into many gardens. The tall, slender pyramid-like shape can serve as a trellis or stand on its own. Obelisks come in metal or wood, or stone that can be engraved. A towering obelisk could certainly become the focal point of your garden. Choose climbing plants that won’t overpower it, but slowly creep to the peak. Just as sundials can transport your garden into ancient times, the garden globe, also called a gazing ball or garden ball, can take you back to an English garden from the Victorian era. Originally hand-blown glass, but now also offered in durable stainless steel, these mirrored globes create a reflection that can showcase the entire garden at once, from ground to sky. They are said to bring happiness and prosperity as well as ward off evil spirits. Legends say people used to place these at their front walk so when witches paid a visit, not being able to bear the sight of their own reflection, they would avoid it and move on. It was also said to have been used as a “butler ball,” in Victorian times, so servants could look at it to see what their guests needed instead of staring at them while they ate. Also becoming popular is the cousin to the garden globe—the toadstool. This more elongated half-sphere also posed on a decorative stand is an interesting accent that will definitely bring some pop to your space. Nothing can be simpler to install in your garden than a decorative stake. While the practical purposes are to provide support for plants and mark the varieties, more and more stakes are on the market that exist for aesthetic reasons only. While you normally find them topped off with butterflies, dragonflies and other creatures you’d find in nature, you will find everything from stars, hearts and the American flag. Stakes are so versatile because you can move them anywhere. Taller stakes, with wind spinners, can even become a focal point of your garden. Stakes with hooks can hold mini bird feeders and mini wind chimes in flower beds and smaller garden spaces. 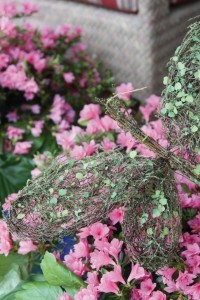 The newer varieties are solar-powered and create a great display at night (see “nighttime accents” at gardeners.com). The company also sells a unique version called the wind stalk. Resembling pond reeds, the shiny rods with several small globes reflect light, making for a whimsical waterside display. Every garden tells a story, but some are closer to our hearts than others. One of my favorite gardens is a tribute to my grandmother outside a centuries-old church she attended as a child in Tennessee. Along with her favorite wildflowers, shrubs and plants, a simple garden bench sits beside a special engraved stone. It is wonderful that her memory lives on through nature, as gardening was such a large part of her life. If you’re looking for an accessory for your garden that truly makes it your own, consider memorializing a loved one. Online sites like perfectmemorials.com offer many garden accessories that are simple but elegant, allowing you to custom-engrave accent stones, stepping stones and candleholders, even using pictures of your loved one. A large variety of statuary stone, in cross shapes or in obelisk or totem styles, can be engraved with Scripture, poetry or favorite sayings. There are also many pet memorial ideas for those friends you treated like a member of the family. In any memorial garden, you need a space to sit and recall all the memories you had with your loved one. Depending on your space, a nice log or small sitting stone will do. Many companies offer engraving on small concrete benches. With the array of choices in garden accessories today, you shouldn’t have any trouble making your garden one-of-a-kind. What you said about planning and buying garden accessories early is so neat. I have been thinking about changing up my garden for the last while and I think art would really add to the feel of my yard. I think tasteful art can add immensely to any already beautiful garden. Thanks for the great read.